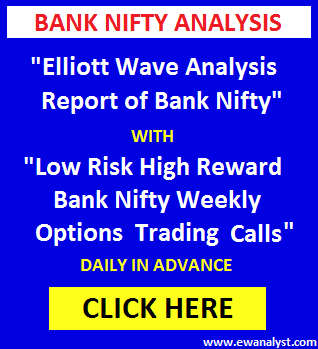 Bank Nifty opened higher at 23636 and after registering high 23640 decline sharply by more than 550 points to register low 23055 and finally closed 326 points down at 23216. Decline towards 23559-23351 was expected in my last analysis report and I suggested buy/hold 23900 Jun Put expecting same targets. 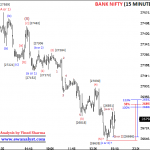 Bank Nifty declined to register low 23055 after achieving our expected targets range. And 23900 30 June put bought in 23806-23900 range gives good profit. 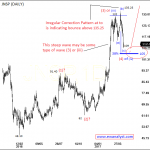 Now, we need to analyze latest chart to find next move. This is daily time bar chart of Bank Nifty covering bounce from 13407 which I am marking as start of wave (v) of (3). It seems wave 3 of (v) completed at 20575, 4 completed at 17606 and 5 in progress. Wave 5 also achieved 61% projection after breaking above 22035 and next 100% projection is at 24774 which may or may not be achieved. Normal 23%-38% retracement of progress of wave 5 of (V) (starts from 17606-23897) is placed at 22412-21493 which is the expected targets range on downside if any bigger correction is started. 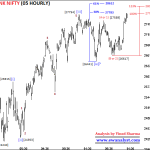 Now, we need to analyze decline from high 23897 on separate lowest possible time frame chart to identify its pattern. 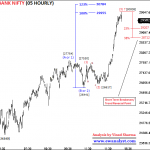 This is 15 min time bar chart of Bank Nifty covering move from all time high 23897. The pattern of the decline from high 23897 looks like a 3 waves move till now. 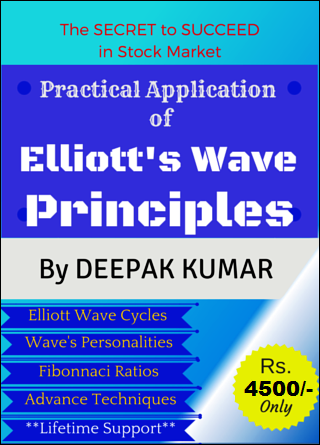 It seems wave (1 or A) may be completed at 23533, wave (2 or B) may be completed at 23640 as Irregular Correction and wave (3 or C) may be completed at 23055 or still in Progress. Wave (C or 3) achieved 100% projection is just short of 161%. 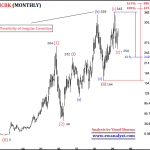 Normal 38% retracement of wave (3 or C) is placed at 23278. 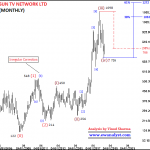 So, 23278 is the point above which we can think of any upside reversal after confirming with the pattern. 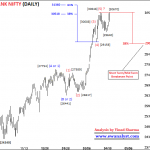 Means we need to see the pattern formed near 23278 to decide further move of Bank Nifty. Bank Nifty declined from 23806-23912 range to achieve our expected downward target range 23559-23351 and even decline further lower to register low 23055. 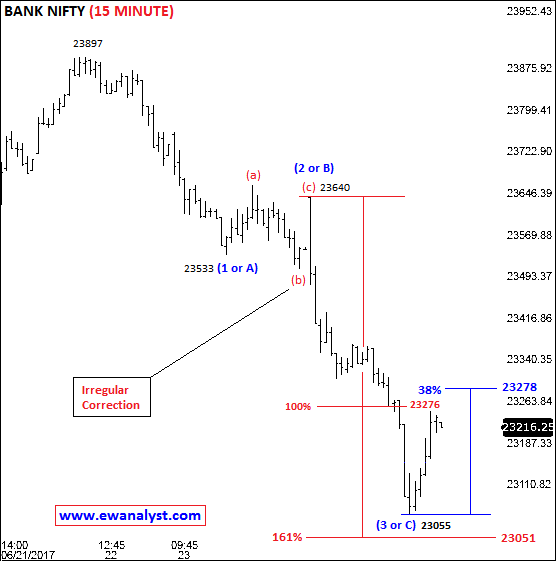 Now, 23278 is the points above which we can think of any reversal after confirming with the pattern. Means, 23278 can be assumed as breakeven point but pattern of bounce from low 23055 will decide if Bank Nifty to move higher after breakout from 23278 or it will reverse back from 23278. 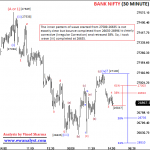 So we need to wait for the formation of pattern near 23278 to decide next trade. 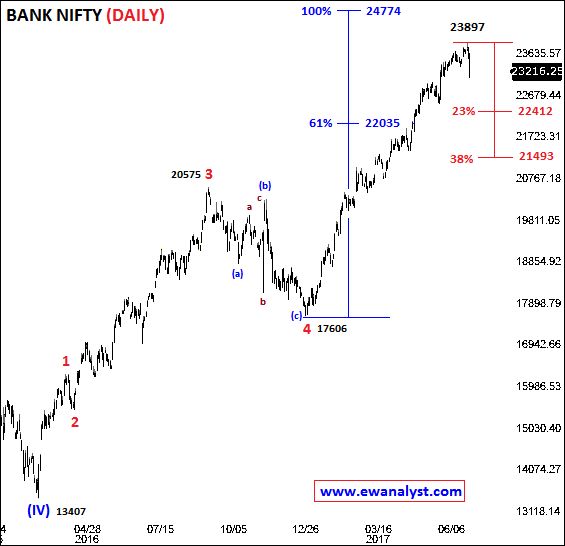 In overall, Bank Nifty can bounce towards new high above 23897 again if break higher above 23278 otherwise a decline of about 500 points is still pending as extended wave (5) downwards (because wave C or 3 is not extended). We need to wait for formation of clear pattern near 23278 to decide next confident trade because 23278 is expected breakeven point between the possibility of new and further decline. Otherwise, experienced traders can use the explained conditions in conclusion to initiate trade by their own risk management.